I was actually quite surprised and taken aback when someone asked me that question. Truth be told, before I was assigned the role of cancer troll, I had absolutely no idea what chemotherapy entails, or how it was administered. I lost my grandmother when I was 16 to cervical cancer. But by the time we found out about the cancer, it was already in the advanced stages and there was nothing much that we could do. While I had brushes with cancer, I never really gave much thought as to how chemotherapy was administered. I knew individuals who survived cancer, but like the most of us, I was too embarrassed to ask what actually happens during chemotherapy or how it was administered. Unlike what Hollywood would have you believe, it is actually a pretty boring process. Before chemotherapy can even be administered, there are a number of tests that have to be done. As much as chemo “poisons” the body, doctors and nurses want to see you get better and do not actually want to poison or kill you. A blood sample is taken and a full blood count is done. Before cancer happened, I had no idea that doctors could obtain so much information from a simple blood sample. In fact I did not even know that there were so many parts to blood. I knew that there were red blood cells and white blood cells but that was probably about it. In my defence I was a physics student and had never taken a biology class. There are mainly three things that the medical team looks out for – neutrophil absolute, platelet counts and haemoglobin. Neutrophils are a type of white blood cells responsible for fighting infections while platelets are responsible for stopping bleeding through clotting. I didn’t know that there were different types of white blood cells either. I thought they were you know..all just white..
Low neutrophil levels translates into difficulty fighting off infections. Low platelets translates into difficult in stopping bleeding. Low haemoglobin levels translates into fatigue. All three of them have to be at least of a certain “safety” level before the nurses are allowed to administer chemotherapy. If you are receiving medical treatment from a restructured hospital in Singapore, you can log onto www.healthhub.sg with your SingPass to review your blood results as well as your recent hospital discharge reports. Not all blood test reports are available online though. Only the very basic ones are as you will need a doctor to review and explain the implications of the others. You can also add your name as a caregiver for another to your profile, as well as names of your children, and review their respective reports. The portal also allows patients to view all medical appointments, across the various restructured hospitals, in one place. Chemotherapy is a broad umbrella term used to describe drugs that destroy cancer cells. It can be administered either orally or intravenously. I am on a protocol known as FOLFOX with the addition of Avastin, and all my drugs are administered intravenously via my port-a-cath. It is a little device that is resting under my skin. 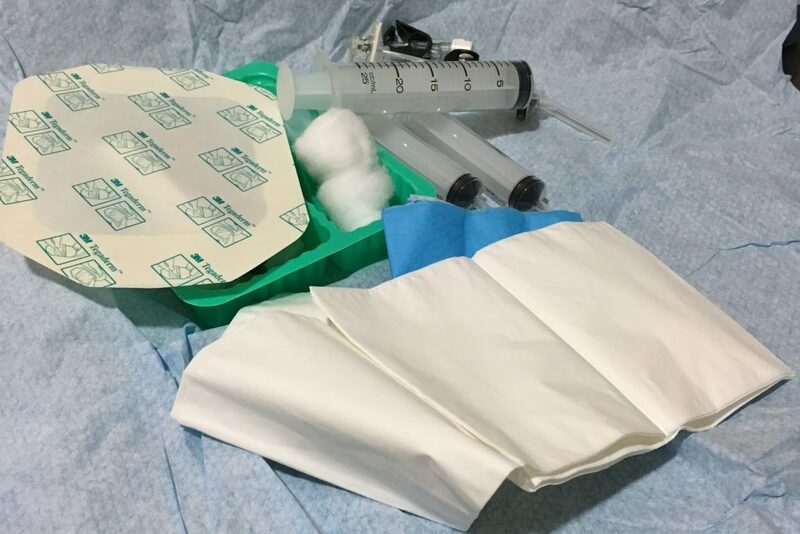 The attached catheter runs in a tunnel under the skin, going over the collarbone and then entering the large vein in the lower neck (the internal jugular vein). We decided to insert a port-a-cath because my veins are really deep and really tiny, making it difficult for nurses to set a line. Once the nurses have checked, and double checked, and triple checked that all my drugs are in order, they’ll connect it to the port and we’re ready to rock and roll. Well actually nothing much happens really after the nurses have set up the drugs. No doctors in white coats running into the room screaming for the room to be cleared. Neither does my hair immediately fall out in clumps, nor do I start vomiting nonstop. The infamous side effect of chemotherapy are usually only felt a few days after treatment stops. There is Wireless@SG in all public hospitals. I usually lug my computer with me to my chemo sessions so that I can watch movies online. It takes us about 4 hours or so, to set up and complete the course of treatment. I’m also always armed with a book, just in case I get tired of watching movies. Movie and book recommendations are greatly welcomed and deeply appreciated! You can definitely can eat during chemo sessions. As there is no room service you are advised to pack some light refreshments. 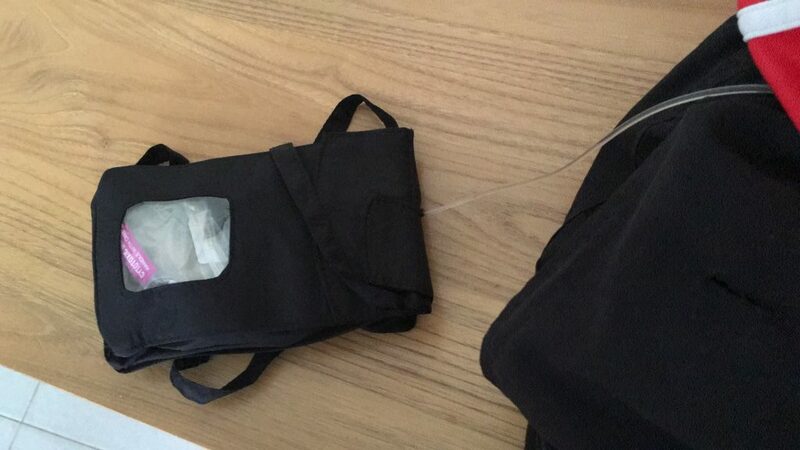 Once done with the Avastin, Folinic Acid and Oxaliplatin infusions, the nurses will detach the bags of drugs. They will then connect the last drug, fluorouracil (5FU) to the port. 5FU needs to be given slowly (2ml per hour) over a course of 46 hours. The port enables me to be able to go home with the drug. While I am able to go home with the drug, having the pump attached makes it more cumbersome to move around. The line for example, must be kept dry and so showering becomes an intricate dance. About 48 hours later, I head back to the hospital for the nurses to remove the pump from the port. Two weeks later, if blood counts are satisfactory, the cycle repeats itself again. The first time cancer happened, I had a port inserted as well. The purple port pictured above is a souvenir from the first time. It is currently sitting at home in a place of honour amongst my other sporting medals. A tube is supposed to be attached to the metal part, and enters the vein in my lower neck. 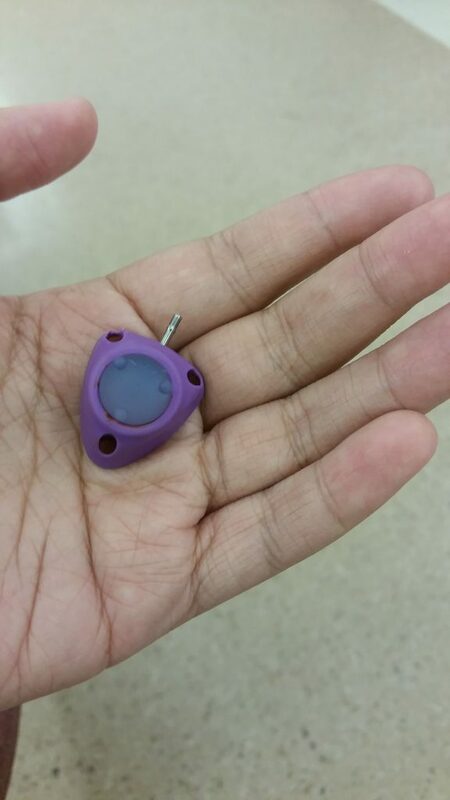 The rubber parts is where the nurses insert the needle. I insisted on taking out the first port. My team’s worry was that the port might be broken if a soccer ball hits it, and the broken pieces puncturing my lungs. With the port, it is also difficult to carry backpacks as the straps will rub against it. I really wanted to go backpacking then, to celebrate being cancer free; I yearned for life to revert back to normal, and wanted all traces of cancer erased. I wanted to go back to being a normal 24 year only, where my biggest worry was explaining to my relatives each Chinese New Year why I was not married yet. And so I took out the first port. I never expected to be back here, and to have completed yet another two cycles of chemo. 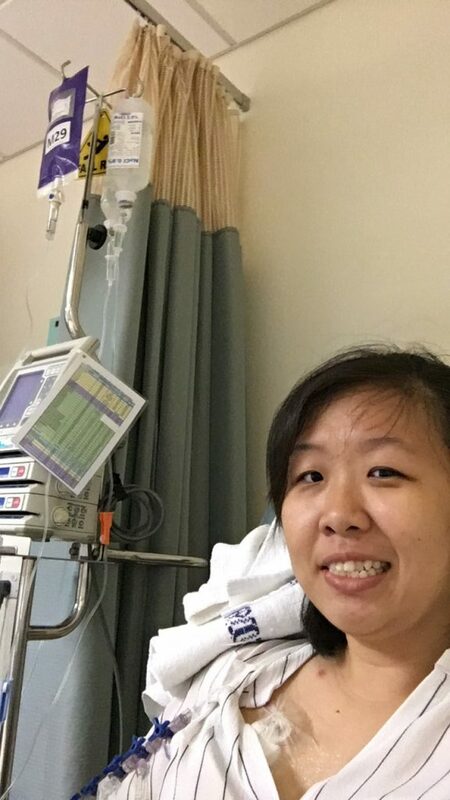 Thanks a lot for sharing this, you are extremely brave and strong, hope the treatments work well for you. Jia you Kimberley!!! I’m totally obsessed with this magazine called lucky peach! You can find on the book depository but if you want I can lend some of my copies to you!